Make your business processes faster and simpler with this easy to use and feature-rich online real estate management service. With complete control of costs, you pay only for what you use. All iRealOne system upgrades are free. Use iRealOne Real Estate Software as long as you are satisfied with it. There are no fees for termination of contract or similar charges. In 30 days Free Trial period for the full version of the system, you make sure iRealOne is the right solution for you. The iRealOne Basic package is COMPLETELY FREE! iRealOne is an advanced online software as a service for real estate management, developed in close cooperation with year long veterans of the real estate industry. While developing the application we took special care with specific details around business processes and protocols required by the real estate brokerage agencies. We automated and made faster various tasks performed daily by brokers, with special attention to security and data protection. Feature-rich database of properties and clients with public and protected information control, brokership journal and complete permission control per broker or group of brokers. Sales and broker efficiency tracking and statistics, per time periods and categories of estate, including notes and client contacts. Search by virtually every component and information field of real estate and clients. Possibility to set buyer criteria and automatically match with properties with notifications. Multiple Listing Service and inter-agency search and exchange, with global buyer match and foreign agencies you can establish business relations with. Data processing for XML (and other protocols) based classified distribution to leading Croatian, Serbian and Slovenian classifieds portals. Automatic image watermarking and resize. Documented API for XML based classifieds syndication for any portal or website willing to implement it technically. Simpe and fast interface allowing templated preparation of brochures for e-mail or printing for your clients, shop window or similar use. Property presentation in the office including digital display based catalogues for your shop window. Professional agency website with advanced search capabilities for your clients. Modern, mobile-first responsive HTML5 designs. Professional e-mail solutions with anti-spam and anti-virus protection and inbox control. All data is kept on multiple redundant servers with automatic backup every 3 hours, once a day, weekly and monthly for the past 3 months. Possibility to archive all data, or monthly deltas, on physical media like CD, DVD, Bluray or USB drives, shipped to you directly. 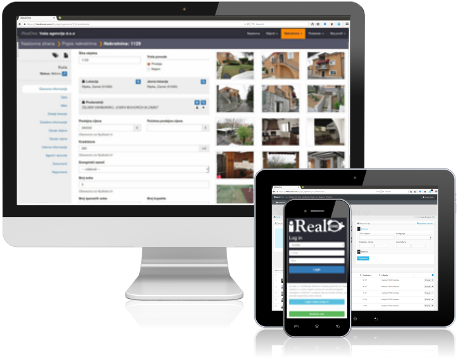 Why is the iRealOne real estate management software your best option? ...and many more useful functions we'd love to show to you! Featuring special offer by the Slovenian classifieds portal Nepremičnine.si21, exclusive for iRealOne clients! Benefit from special pricing and advertisement plans, tailored for iRealOne clients by these partner portals. 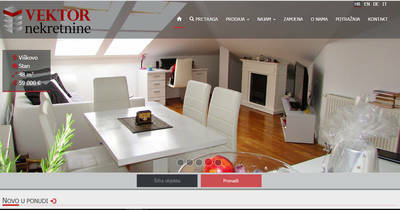 Special discount on the Nepremičnine.net portal, only for iRealOne clients! The list is not final or complete, we keep adding new advertising channels and portals as they become available. This website is leaving cookies on your computer for the purposes of navigation and anonymized statistics. By using this website you agree with and accept these cookies.